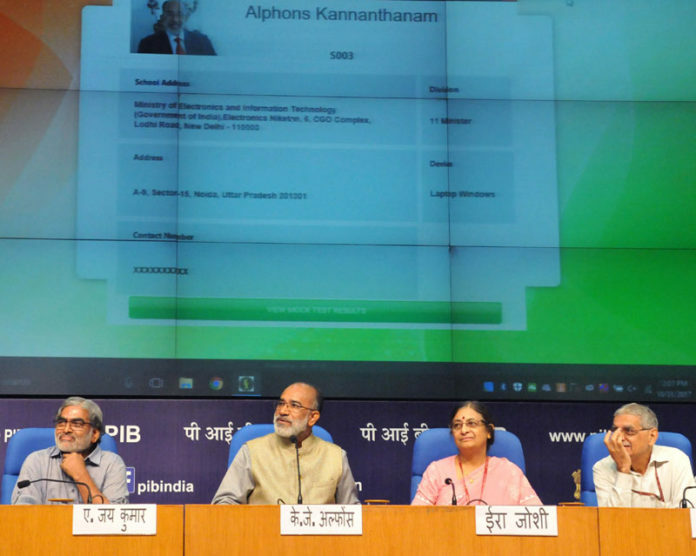 The Minister of State for Tourism (I/C) and Electronics & Information Technology, Shri Alphons Kannanthanam at the launch of the Vidyarthi Vigyan Manthan App, a talent search hunt initiative, in New Delhi on October 31, 2017. A record number of over 91,000 students from 2078 centres across the country are expected to take the test on the same day. One of the unique features of this examination is that the test will be conducted online. Students will attend the exam through the various digital devices like, mobile, tablet, laptop or desktop in line with the vision of Digital India Campaign. A Mobile app called the VVM App was launched at a function in the national capital today by the Union Minister of State for Electronics and Information Technology and Tourism, Shri Alphons Joseph Kannanthanam. The National Secretary General of Vijnana Bharati, VIBHA, Sri Jayakumar was present on this occasion. After the App release, nearly 125 students appeared in the mock test during the function as a demonstration of the online examination in the presence of Honourable Union Minister. The syllabus for VVM to assess the students in phase-I are; 1) Science and Mathematics’ (40%) of NCERT syllabus of respective classes, 2) Indian Contribution to Science (20%) (Specially designed reading material) Published by VIBHA, 3) Biography of Dr.Vikram Sarabhai and Dr.Homi Jahangir Bhabha (20%), it is the motivational glimpses of the Indian Scientist of the Year (Specially designed reading material) and 4) General knowledge, Logic and Reasoning (20%). The VVM study material is made available to all students on the website from 01 October 2017. The examination will be conducted for two sections, junior classes (VI-VIII) and senior classes (IX-XI). However, for the evaluation purpose, students from respective classes will be compared separately. VVM is going to attempt the Guinness Book of World Record for largest online science examination for school students wherein more than 91 thousand students from 2078 centres across the country will be appearing in the examination. All the registered students will go through the mock tests to get them acquainted with the VVM APP for final examination scheduled on 26th November. 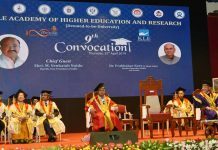 VijnanaBharati (VIBHA) is one of the largest science movement in the country led by eminent scientists and to inculcate and generate scientific temper, foster excellence in students and nurture and mentor them for their careers in pure sciences. Through VVM programme, India’s generation next will be made aware about the India’s Rich Contribution to Science from ancient period to modern times. Registered students will undergo multilevel testing. Successful students will get a chance to undertake study tours and interactions with renowned scientists of our country as well as abroad. The details regarding VVM can be accessed on www.vvm.org.in.